Erleben Sie den Zauber von Istanbul in der Dämmerung auf dieser 4-stündigen Kreuzfahrt entlang des Bosporus und genießen Sie die Aussicht auf die europäische und asiatische Seite. 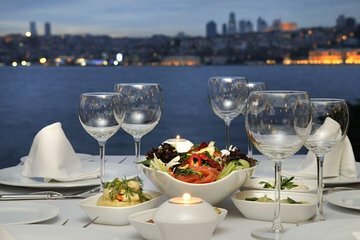 Genießen Sie ein reichhaltiges Abendbuffet mit einheimischer Küche, während Sie an beleuchteten Sehenswürdigkeiten wie dem Dolmabahçe-Palast, der Bosporus-Brücke und dem Beylerbeyi-Palast vorbeifahren, und beobachten Sie, wie die Bars und Nachtclubs am Wasser die Stadt in ein Neonmeer verwandeln. I didn't quite know what to expect but it didn't look anything like the adjacent photo might suggest. We were a party of four, two adults and two teenagers. The transfer from the hotel to the boat was timely but we waited in a hot van for 30 minutes or more waiting for other passengers. Upon arriving at the boat we were seated below deck at long tables of twelve, where we waited again for about an hour for the boat to fill up. It was completely dark by the time we started cruising the Bosphorus. The service on the boat was good but the food was not so good. We then went to the upper deck which held a dance floor and seats. The dancers were very good and entertaining. We cruised along the Bosphorus but did not get close to any of the historical sites of the old city, which was disappointing. After some time of cruising up and down the same strip we became a bit tired and the dance floor was happening. It looked like a lot of fun but it wasn't what we expected, after a long day of sight seeing, we weren't in the mood for a disco. So if you are looking for more of a dinner/BOOZE cruise this is for you. From the attached pic I thought we were in for a elegant dinner cruise at twilight not a BOOZE cruise. The van transfer back to the hotel was a nightmare! Three of the other passengers where DRUNK and disgusting young men who were very, very vulgar and at one point I thought my husband might have an altercation with them. So, maybe you should change the picture and description as to not be misleading. A nice experience, good atmosphere and an interesting entertainment on the ship. We were on a month long trip and the Dinner Cruise on the Bosphorus was a highlight, the cultural dancers were great and very entertaining.